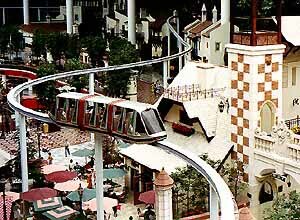 Lotte World was the first permanent installation of an Intamin People Porter class minirail. The three-car trains have a capacity of 18 passengers and travel a leisurely 2.9 meters per second. Maximum distance between supports is 12 meters.The guideway is only 230 millimeters wide. Probably the most impressive feature of Intamin's People Porter is its capability to easily climb or descend 20 percent grades. The Lotte World monorail connects a large indoor amusement area (pictured here) with an outdoor island with more amusements.